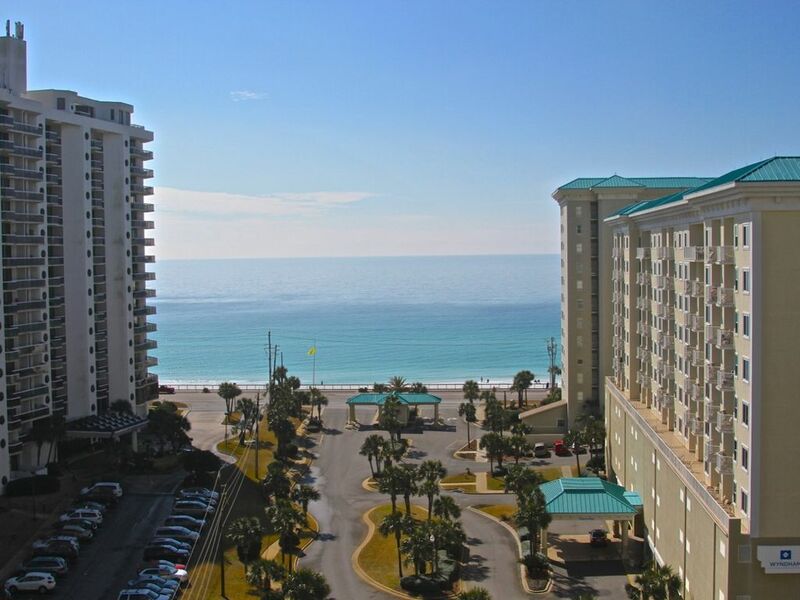 Welcome to Destin, Florida with sugar-white sand and emerald-green waters! We have a two-bedroom, two a bath condo on the 10th Floor fully furnished with all kitchen appliances, towels, linens, blankets, and even beach towels! Master bedroom has a King sized bed, closet, full bath, and a 32" TV with DVD Player. Master bedroom has a sliding glass door to a patio that has a beautiful view of the Gulf of Mexico! In the 2nd bedroom there is a full size bunk on bottom with a twin on top, 32" TV and DVD player. Your kids or even adults will be entertained with a Galaga/MS. Pacman video arcade game, yes just like you see in the arcades! Living Room there is a 60" Flat screen smart TV while u are sitting on the couch with sleeper looking out the sliding glass doors at the breath taking views of the Gulf! There is a recliner and a lounge chair too for your comfort while watching movies on your smart TV or VCR/DVD player. Dining Table for 4 and 3 stools at the bar. We do have a few extra chairs to use at the dining table too. There are many amenities to enjoy at Aerial Dunes, two large pools (one heated). There is a workout room for your use while u are there to stay in shape. There is a restaurant/bar right there called the Cabana Cafe, which has very good food. A short walk to the private beach! We have extra chairs and umbrellas for your use. For the children we have boogie boards, skim boards, plenty of sand toys, many toys for the kids to play with and a cart to put all your things in! Aerial Dunes is located in Seascape which you can get to off of 98 or Scenic 98. There is a huge outlet mall minutes away! There are many great restaurants near by to enjoy! If you are a golfer, you have a course right out your front door! Super Wal-Mart is about five minutes away and you have a grocery store right around the corner, Winn Dixie! There are several shops and restaurants that you can walk to! Many miniature golf courses and go-carts and other rides for your kids to enjoy near by in Destin along with the Big Kahuna Water Park. Come and stay at our condo and enjoy the white sandy beaches and the crystal-clear water! Keywords: Beautiful view of the Gulf of Mexico! 60" TV to enjoy! Pools, pack-n-play, high chair, Beach towels, boogie boards, skim boards, beach chairs, umbrellas, etc, Iron, iron board, blow dryer, electric grill! No Smoking! It was great! I really needed the getaway and didn't want to leave the beautiful spot!!! The condo was very clean and well kept. We had a wonderful time. The beach is a short walk away, as well as some great restaurants. Thank you Lynda for the great accommodations, we will be back. This is the nicest condo I’ve stayed in during my visits to Destin!! Unit is extremely clean and kitchen has everything you need. Very homey feeling I guess you could say. Owner was very responsive. Thanks! We enjoyed our stay here very much! Easy access to the beach and surrounding restaurants. The condo was comfortable and roomy for the 4 of us. We will definitely stay here again if it's available. Easy access to beach! Kids loved it! Great place to stay. The swimming pools were great with the added bonus of a restaurant/bar on site. Easy access to the beach. Thank you for taking the time out and leaving a review. Hope you will be back to stay with us again real soon! Glad you enjoyed your stay! This condo was everything !!! I loved the view we had of the ocean & beach ! The condo had everything that we needed and more! The location was perfect any shopping that we needed or wanted to do was only a 15 min drive with traffic. I can't wait to come back next year and hopefully me & my family can get the same condo! This was my 1st time useing the homeaway app and I can't stop telling people about it and the condo !